Spending more than you earn is never recommended, yet Americans are doing just that. Are you one of them? Follow the money and see our biggest expenses. Although we often regard it with dread, debt can be a powerful addition to one's financial arsenal. Taking out loans you can responsibly repay can make valuable investments possible, from homeownership to higher education. Yet for millions of Americans, debt is symptomatic of a more concerning struggle: the gap between what they earn and the cost of their lifestyles. And if countless celebrity bankruptcies are any indication, the gulf between earnings and expenses can cause trouble no matter how much money you make. We decided to study the trend of Americans living beyond their means at various income levels, using data gathered from the Bureau of Labor Statistics' annual Consumer Expenditure Survey. We then asked a certified financial planner (CFP) to suggest the ideal percentage of one's income to spend on a range of expenses and compared reality to her recommendations. Our findings reveal just how often individuals spend more than they can afford, and where their money goes when they do. To see how people are spending cash they really don't have, keep reading. No matter how high your salary is, a sizeable portion disappears once taxes and expenses are accounted for. For those living beyond their means, in fact, they'll be left with less than nothing – and that unhappy cohort is larger than you might imagine. Our data suggest individuals earning less than $50,000 a year after taxes are typically spending more than they make. Among the very lowest earners, in fact, expenses represent more than twice post-tax earnings, a truly frightening financial situation. 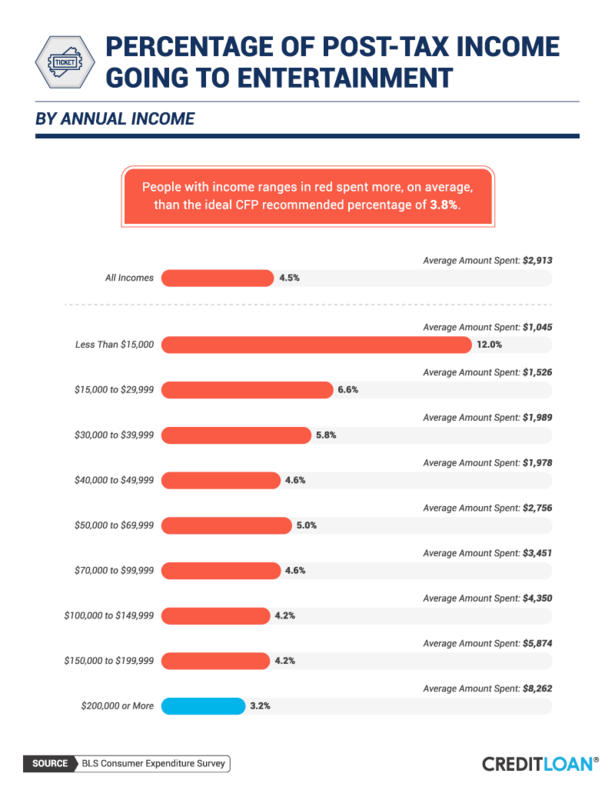 Even in slightly higher income ranges, expenses consumed the vast majority of earnings. For those making between $50,000 and $149,999 a year, expenses represented at least 80 percent of post-tax income on average. There was more breathing room for the highest range of earners, however. Among those making $200,000 or more annually after taxes, about $95,000 was left over after expenses on average. That means this privileged group has more money left over than the vast majority of Americans make. On average, Americans who earned less than $50,000 spent more than they made each year. This dynamic was relatively modest for those earning between $40,000 and $49,999 annually, but the excess cost of expenses represented an unsettling portion of income for those who made less. Individuals who took home less than $15,000 after taxes saw annual debts amounting to nearly 171 percent of their income, a fast track to financial trouble. This phenomenon may explain why so few people can accrue substantial savings. In fact, recent research suggests nearly three-quarters of Americans have less than $1,000 stored away – leaving them vulnerable should a financial emergency arise. At income levels higher than $50,000 a year, however, we found far more opportunity for savings and investment. In fact, those making $200,000 and up had more than a third of their earnings left over after expenses – a dynamic that likely contributes to America's growing wealth gap. Even for top earners, however, the temptation to burn extra cash can make saving a challenge. If you suspect you're too undisciplined to resist spending, digital tools can help make saving an automatic process. Although most Americans spend pretty heavily on entertainment experiences, the CFP with whom we worked on this project suggested most of us should be throwing less money at the fun stuff. When we contrasted her recommendations with what each income level actually spends on entertainment, all but the top earners were overdoing it. This was particularly true for those making less than $15,000, who typically spent 12 percent of their income on entertainment. According to our CFP, that percentage is more than three times what it should be. At slightly higher income levels, the rate was a bit better. For those making between $30,000 and $199,999, entertainment expenses represented between 4 and 6 percent of post-tax income. 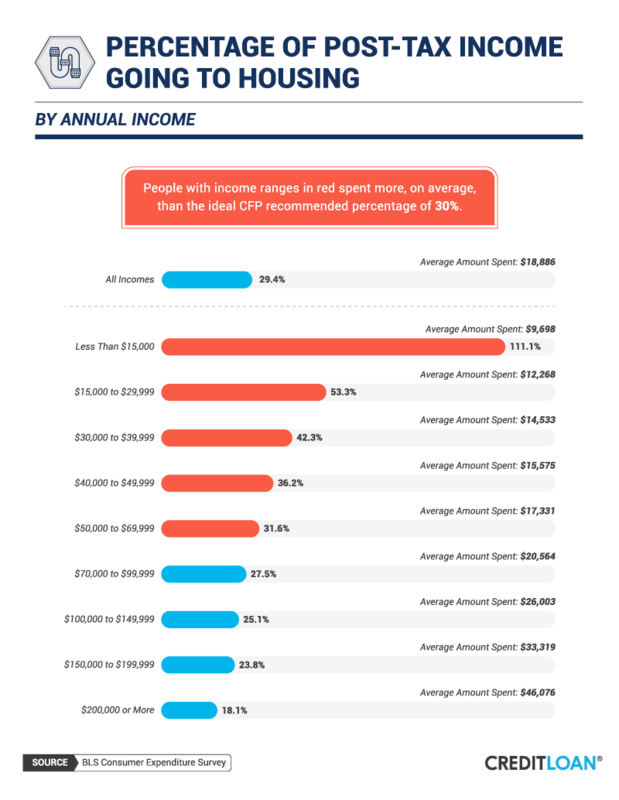 For those taking home $200,000 or more, entertainment expenses amounted to 3.2 percent of real income, despite this cohort typically spending over $8,000 a year on fun. Before you renounce all entertainment until you're rich, though, it's worth noting indulging yourself once in a while is possible on any budget. But you'll need to plan your enjoyment priorities rather than spend impulsively when the mood strikes you. Everyone needs to eat, but where and what you consume can lead to significant financial differences. Our CFP suggested 10 percent of post-tax income should go to groceries, a standard all but the two lowest income ranges met. Even individuals with lower incomes might be able to bring their grocery bills into this ideal range by utilizing discounts and other smart shopping strategies. Yet Americans' thriftiness regarding cooking at home could have a darker explanation: They're eating out too often instead. In this regard, the division between high and low earners could not have been clearer: Those who earned less than $70,000 after taxes spent above what our CFP advised on dining out, whereas those who made more were typically within the recommended range. One explanation for this trend could be the availability of groceries in lower-income neighborhoods. Often, grocery stores are located miles away from poor neighborhoods, making takeout the only convenient option in so-called "food deserts." Americans' health care costs are among the highest in the world, so our CFP advised devoting 10 percent of post-tax income to the costs of staying well. On average, those making $40,000 or more after taxes met this standard – and those making less did not. The threat of high health care costs could explain lingering health disparities among income groups: Financially disadvantaged individuals may skip routine or preventative care, ultimately leading to worse health outcomes. Unfortunately, these untreated issues often require emergency care later, which can result in sky-high medical debt. Our findings do suggest wealthier individuals may be paying for more preventative services or care of a higher cost and quality. Americans who earned $200,000 or more spent nearly five times as much on health care each year as those who earned less than $15,000. High housing costs remain a vexing challenge throughout much of America, leading to a troubling surge in homelessness in recent years. Relative to our CFP's proposed standard for housing costs (30 percent of post-tax income), those who made less than $70,000 a year usually spent more than was financially prudent. In fact, for those who made less than $15,000 a year, housing costs typically exceeded their take-home incomes. For those making between $15,000 and $29,999, housing expenses consumed the majority of their post-tax income on average. These daunting statistics could reflect a number of factors, including high rents and a recent uptick in mortgage rates. But top earners still spent over $46,000 annually, more than double what the average American spends each year. Transportation costs can pose a Catch-22 for low-income workers: If you can't afford to travel to work, you can't maintain employment. But our data suggest all income groups are spending too much on getting around, allocating far more than the 7 percent of post-tax income our CFP recommended. Perhaps excessive transportation costs stem from recent trends in American travel. Consumers are relying less on public transportation and more on ride-sharing services, and that convenience comes at a cost. Or perhaps the modern transportation landscape simply entails more costs these days, such as the upcharges airlines have now instated for privileges that once came standard. Indeed, wealthy Americans seem not to be skimping on luxurious modes of transportation, shelling out more than $19,000 annually on average. Our data suggest living beyond one's means isn't a rarity: For many with a limited income, excessive spending seems like a necessity of daily survival. But this path is ultimately unsustainable, as those confronting these circumstances surely recognize. A pattern of growing debt will eventually result in financial ruin – but that dynamic can be reversed. In fact, millions of Americans have successfully transitioned from living paycheck to paycheck to having true financial stability. But this transformation requires a well-informed approach to spending and saving, and the dedication to stick with it. The key to living within your means is discipline: When old habits and desires arise, it won't always be easy to stay focused. If you're beginning the journey to financial stability, or simply want to get savvy about your money, we offer dozens of guides and articles covering all things fiscal. Explore them to see where you can save and earn money in unexpected ways. After all, living within your means is a lot easier when your budget gets a boost. We collected data from the U.S. Bureau of Labor Statistics' Consumer Expenditure Survey. The data are the most recent available and were made public on April 26, 2018. The summary data were segmented by income ranges by the bureau. The data can be found at CE 2016 Table 1203. 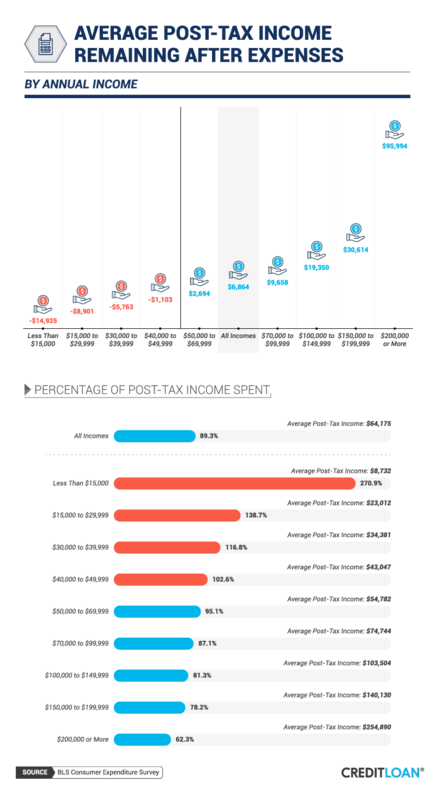 We compared average post-tax income to the average total expenditure for each income class segment. 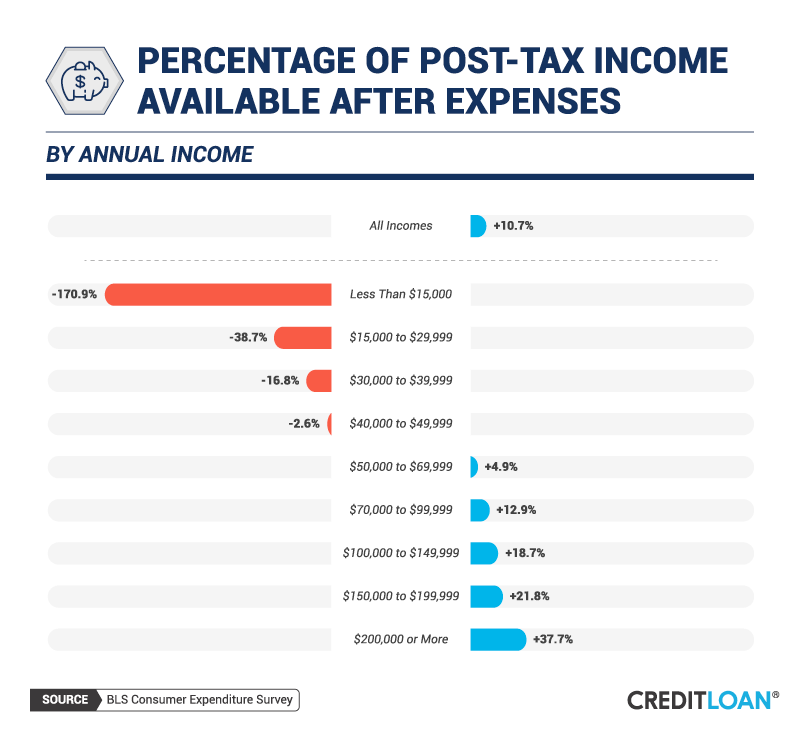 To supplement the data, certified financial planner Carol O'Rourke of OnTracktoFinancialWellness.com provided the ideal percentage of post-tax income the average American should spend in various expense categories. 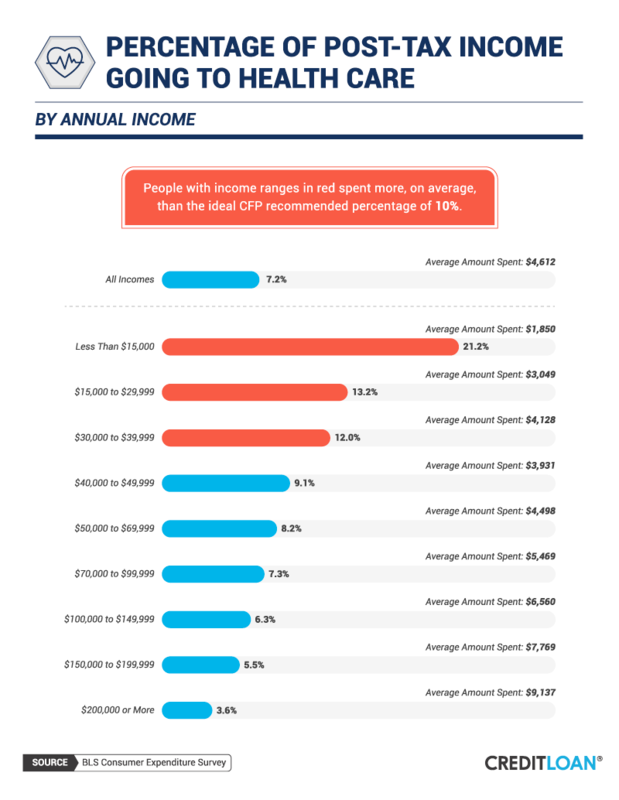 We used one CFP's ideal percentages of after-tax income the average American should spend in various expense categories. Another CFP's percentages may be different than the ones displayed here. You're welcome to use our findings and graphics to share with your own audience for noncommercial purposes. If you do use our content, please attribute us appropriately with a link back to this page. Since that's the only price you'll pay for using our work, sharing it is still a great investment.